I got home from work today and was greeted by Amazon’s erection on a box. 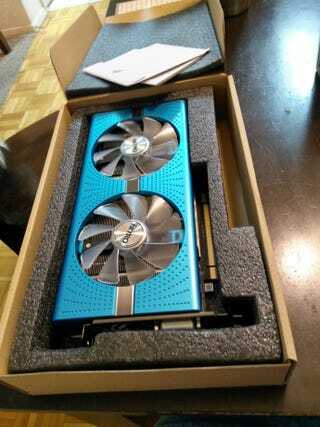 Inside revealed my new GPU in the form of a Sapphire Nitro+ RX590. Modern hardware is marvelous thing. Unplugged the old GPU, plugged in the new GPU, booted up and the thing just plain works even on whatever default driver windows 10 used until I installed the correct ones. For recap, this was added to my Ryzen 7 prebuilt Dell gaming machine named Gus. A few of you may recall I picked up Gus around a year ago at the height of the mining craze. It pained my to buy a prebuilt machine, but I was coming back into the PC game for scratch after many years of laptop only ownership, and Best Buy had this machine on sale for less than the price of the GPU and CPU alone on the market at the time. They threw in 16GB of ram, the rest of the machine and a fast 27" monitor for free as far as I was concerned. I added a Crucial MX500 500gb SSD as a boot drive, grafted in a second case fan and a matching stick of ram for 32GB in dual channel off the bat. I ended up upgrading the power supply in short order. The original dell 460w power supply was marginal for the machine, lacked an 80+ efficiency rating of any kind and generally did a convincing impression of a space heater whenever the system was under load. With just a small bit of modification to the case, I grafted in a Seasonic Focus gold+ 750w and life has been enjoyable racing sims ever since. That said, things could be better. Dell’s locked down BIOS is garbage, the VRM solution on the X370 board is molten under load and the RX580 was a reference blower card of which I’ve grown tired of listening to its fan noise. The upgrade from an RX580 to a RX590 isn’t worth making in many use cases, but I had been thinking lately about where I wanted to take my battle station. Prices on 29"+ monitors with fast refresh rates and high resolutions haven’t yet fallen to a level that I would pay for, so I’m probably sticking to 1080p for the next couple of years. My main goal was to get rid of the damned fan noise from the reference card. This 590 solved that problem, gave me a bit of a boost and should suffice for as long as I’m messing around at 1080. It was $265 from Amazon for the card, and it also comes with codes for 3 upcoming games. None of those games interest me, and it looks like I can sell the code for $40-$50. I should also be able to sell the old RX580 for around $150. In the end I can justify around $100 for little to no fan noise,a 300mhz clock boost and 100mhz memory clock increase. The card will post around a 90fps average in F12018 with settings maxed out. Even manually maxed out, the fan noise is hardly much louder than the CPU and case fans on the machine. I’ll take this result. All this said, I’ve got my old card for sale if any Oppos are in the market for a GPU. RX 580/8GB reference card. Never overclocked, works fine, from a machine used primarily for Oppoing in the evenings and some periodic gaming on weekends. It ought to run pretty much anything at 1080p/ultra settings. It is noisier than I preferred, but that is a function of being a blower card and not anything wrong with this particular one. 3 display port and 1 HDMI output, does freesync. Call it $100 shipped (to an Oppo, in North America).